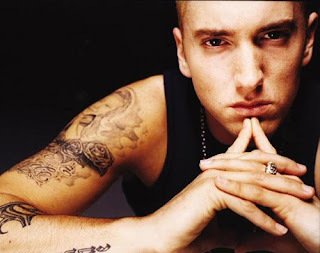 Your Guide to Fitness: Give It Up To My Man....EMINEM!! Give It Up To My Man....EMINEM!! Yeapp...HOLLA at Eminem! I love his come back album and being mature in his raps. It's all started on one boring morning and was watching MTV and there it was his "Not Afraid" video played. Somehow like magic, it really moved me. That moment my whole life was falling apart. My fiance ( now ex fiance aka John Tucker ) is being a total jerk, I'm glad I made it through the storms he's been giving me. Well, anyway, let's get back to Eminem now. Since his songs are in iPod and I keep listening to them while working out. The energy is huge, I feel the power running through vein listening to his music. What do you know, when I use to listen to up beat music for exercise and turn out rap can be motivating music. My weight training is improving, my muscle mass increased. I feel so GREAT! !